Rosetta is destined to make a controlled impact into the Ma'at region of Comet 67P/Churyumov–Gerasimenko on 30 September 2016, targeting a point within a 700 × 500 m ellipse (a very approximate outline is marked on the image). The target area is home to several active pits measuring over 100 m across and 60 m deep, from which a number of the comet's dust jets originate. Some of the pit walls also exhibit intriguing metre-sized lumpy structures called 'goosebumps', which could be the signatures of early cometesimals that agglomerated to create the comet in the early phases of Solar System formation. 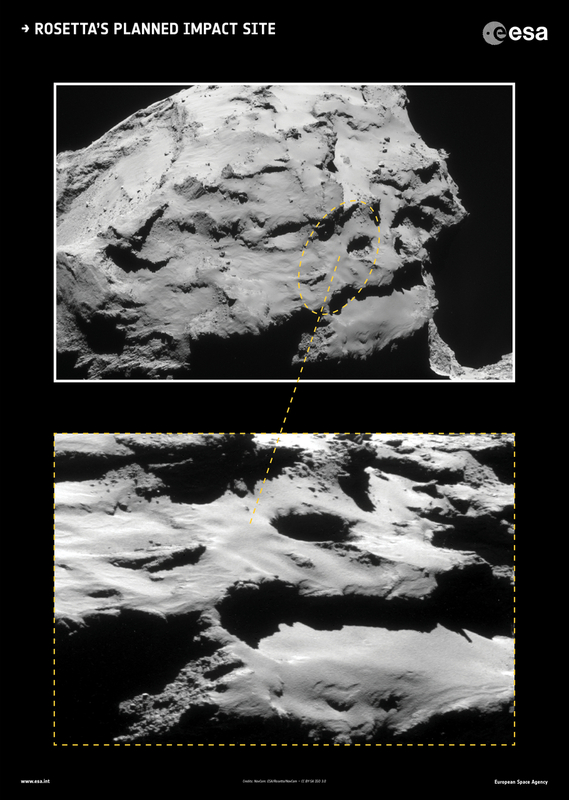 Rosetta's final descent may afford detailed close-up views of these features. The full size inset image can be found in the Archive Image Browser.